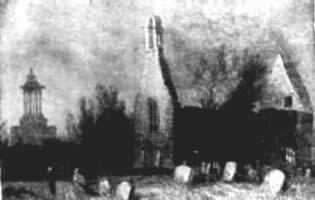 The Alloway Strange family arose in New Kent County, Virginia at the same time the Blisland Stranges appeared, in the late seventeenth century, and has yielded two variant surnames, namely Strange and Alloway. This branch produced several men with distinguished military and government careers. John Alloway Strange (1727-1811) of Oak Hill, Fluvanna County, Virginia, is the earliest progenitor firmly identified, and he gave rise to colonel Gideon Alloway Strange I (1793-1838) of Dog Point, who begat the Confederate hero Colonel John Bowie Strange (1823-1862). The family also produced Glen Strange (1900-1973), the Western movie stunt actor best known for his role as the bartender in Gunsmoke. Robert Strange McNamara (1916) became United States Secretary of Defense (1961-1968). For further information, please see the Table of Contents, Book X, The Alloway Strange. NOTE: The printed version of this book is out of print. The .PDF file referenced below is still available. PayPal is the easiest, fastest way to pay for and receive your order and it is free for buyers. Orders placed using PayPal can be filled immediately. It is an instant and secure online payment service. Payment is made through a credit card or checking account. PayPal can also handle international payments and the currency exchange. If you would be paying in funds other than U.S. dollars, you may wish to consult a Currency Converter. If you are purchasing more than one book, please contact Arapacana Press for shipping costs. .PDF file of Extraneus, Book X, The Alloway Strange , by John R. Mayer, third edition, 2001, $10.00. A link would be sent by e-mail to download the .pdf file.